Canon John Suggit with the citation of the award conferred on him by Archbishop Thabo Makgoba. At a service to celebrate the 70th anniversary of his ordination as priest, one of the church’s leading theologians, the Revd Canon John Suggit, has been presented with the Archbishop’s Award for Peace with Justice. The service was held at St Margaret’s Church in Fish Hoek, in the Diocese of False Bay. Among those who attended were clergy who studied at the old St Paul’s College under Canon Suggit, including those holding a 50th anniversary reunion. Among other recipients of the award have been Archbishop Emeritus Desmond and Mrs Leah Tutu, former South African Public Protector Thuli Madonsela, Professor Barney Pityana, former Deputy Chief Justice Dikgang Moseneke, retired President Kenneth Kaunda of Zambia and retired Bishop John Osmers of Zambia. The citation for the award, presented by Archbishop Thabo Makgoba, follows. The Revd Canon John Suggit came to South Africa in 1948 with his wife, Thelma, after graduating with degrees in Classics and Theology at Worcester College, Oxford. Ordained deacon and priest in Grahamstown (now Makhanda) during that year, he served successively as a curate and acting Rector at the Cathedral of St Michael and St George, then at St Hugh’s in Newton Park, Port Elizabeth – where he and his parishioners built the church as a “do-it-yourself” exercise – and at St Michael and All Angels’ in Queenstown (now Komani). In turbulent times, John Suggit’s writings have played an important role in underpinning our Church and its witness. His devotion to the centrality of the Eucharist and his example as a model of what priesthood should be are an inspiration to us all. 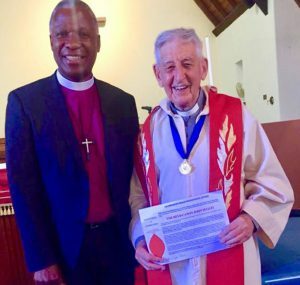 The Anglican Church of Southern Africa is honoured to recognise this pastor, prophet and priest who has selflessly dedicated his life to the liberation and welfare of God’s people with the Archbishop’s Award for Peace with Justice. Thank u very much Conon Suggit . I Wonder as to what would (u) he recommend as neo-theological education development of our ordinants given the mushroom theological training institutions in some of our Dioceses. A truly remarkable mentor. I had the privilege of being in his last group of students at St Paul’s, and in his first group of students at Rhodes University.